Just got back from our trip to origins and I’d really like to tell you all about a game that I had a ton of fun with while I was there. I wound up purchasing it and I’m extremely happy about making that decision so I really want to get the word out about Chaostle as soon as possible in hopes that anyone at origins or heading there knows to not pass this one up. The six-hour drive to origins was worth it alone! Okay so let’s lay out the basics. 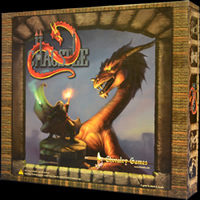 Chaostle is a board game for 2-8 players wherein each player controls 2-3 heroes (depending on # of players) that need to race around the castle board and reach the sanctuary in the center. It uses only 6 sided dice and plays with a great blend of both luck and strategy. Sounds pretty simple right? 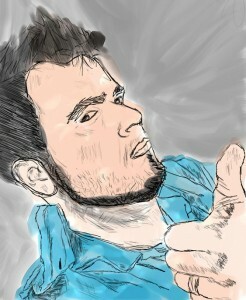 That’s because it is, it’s simple piled on with layers of awesome and chaotic fun. The board is square and divided into colored quadrants and each player has a color (indicated by snap on bases that go under the minis) that corresponds with one of those areas which also govern the direction a player moves across the board. Some players will move clockwise, and the others counterclockwise making for some good clashes and battles along the way! There are also several 3D castle pieces that represent levels/floors of the castle that your characters can traverse on their way to the castle sanctuary at the center of the board. 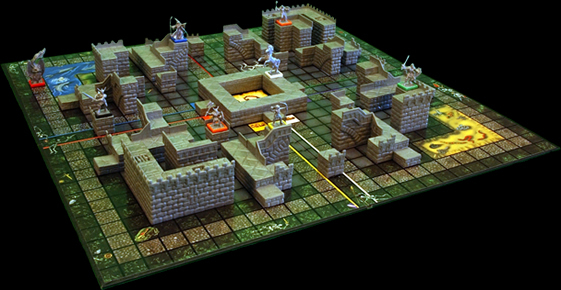 The castle pieces make ways for shortcuts to get across the board faster, and there are several areas on the board that have special properties as well – like landing on the lucky frog that restores all of your active characters HP. There are a total of 16 characters which each hail from one of the four origins: Good, Neutral, Chaos and Magic. When choosing your heroes for the game you need not adhere to the 4 origins, so you can mix and match as much as you like. Each character has its own miniature and character card. The character cards have notches for a series of small pegs you push into them to indicate things like HP, upgrades and other special abilities. Speaking of upgrades, (which you earn upon defeating an enemy or via other special conditions) the range and damage of a characters attack are upgradable as well as armor, movement speed and special abilities. Each character also has a level ranging from 1-3, which serve as means to balance player resources, there are an equal amount of each level character within the game (in my demo games each player controlled one of each level). Each character has 6 attacks/weapons for use in combat, determined by a d6 roll. Characters trade blows until someone is defeated or until the initiating attacker decides to voluntarily end the combat. Character special abilities make combat vary greatly and create very unique situations that are fun and engrossing. There are obvious synergies and strengths/weaknesses presented in fantasy RPG’s – Archers have greater range than any other character, some magic users can heal or have devastating attacks, warrior types are heavily armored, etc. There are a few characters that are especially unique too, such as the dragon, the unicorn and a few more. The quality of the pieces here are stellar, the minis appear metallic but are actually plastic and quite durable. Each miniature was custom sculpted for the game so you won’t find any reaper sculpts here, also all of the artwork was created specifically for the game too and it’s very well done. The 3D castle pieces are custom work done by Bruce Hirst of Hirst Arts and the character cards are made of a very thick cardboard. Chaostle contains game elements that are very near and dear to me (checkpoints, upgrades, unpredictability, strategy) it almost feels like a tabletop pvp version of Gauntlet. Though instead of trying to defeat waves of minions I’m trying to blast apart my friends and reach the big shiny prize at the end before they do. I’ve been trying to think of short descriptors for Chaostle while I wrote this review, and although some of the better ones: “Gauntlet PvP Race”, “Castles and Carnage” or “The Medieval Fantasy SORRY!-esque game where you attempt to kill and maim your friends” don’t nearly quite fit the bill. This is a game that doesn’t try and describe itself by using games that came before it so I shouldn’t either, Chaostle does a great job of carving its own name out in the board game arena. The folks from Chivalry Games did an awesome job of demo’ing the game and were extremely friendly, enthusiastic and amiable. If this game sounds interesting to you I highly recommend picking it up, it will definitely bring tons of hours of fun gameplay for you and your gaming group. Especially on those nights where you might feel a bit more like beating up each other for a change! NOTE: If you’re currently AT Origins, the Chivalry Games booth is toward the very back left (not sure the exact direction or booth #, but this is in reference to using the exhibition hall main entry as your origin point) so don’t miss it! Get in on a demo in the open gaming hall if you can too, if you buy it at the con it’s only $55.